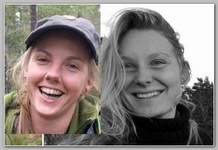 Three men were arrested on Thursday 12/20/2018 over the murder of Louisa Vesterager Jespersen, 24 (L), from Denmark, and Maren Ueland, 28 (R), from Norway. They had travelled together to Morocco for a month-long holiday on 9 December, including a trip in the Atlas Mountains. Louisa Vesterager Jespersenand Maren Ueland had been hiking in area near Imil, close to North Africa’s highest mountain peak Mount Toubkal – an area popular with hikers and climbers. They were found dead inside the tent they shared. The pair were found dead from knife wounds near a popular tourist spot on Monday 12/18/2018 One person had already been arrested on Monday, hours after the bodies of the two women were discovered with injuries to their necks. ccan news outlet 2M said they were shepherds, and had been arrested in the city of Marrakesh on Thursday morning. After the prime minister’s statement, Denmark’s PET intelligence agency said it was investigating a video circulating online, which appeared to show one of the two women being murdered. in the video, the words “this is in revenge for our brothers in Hajin” are heard, a reference to a stronghold of so-called Islamic State- I.S.I.S – in eastern Syria that was seized by US-backed forces earlier this week. “We cannot say anything at this point about the video’s authenticity,” PET said, contradicting earlier reports that it had been verified.